Sometimes we have to walk on a ‘road’ aways or keep the dogs from ‘hunting’ some other pesky hiker, particularly in NPs (where the JRs have every right to be – they are Australians TOO, and pay all their taxes on dog food, etc!) Lately, the prevalence of unexpected fox baits makes getting the dogs under control important too, so these lightweight leashes are the answer. 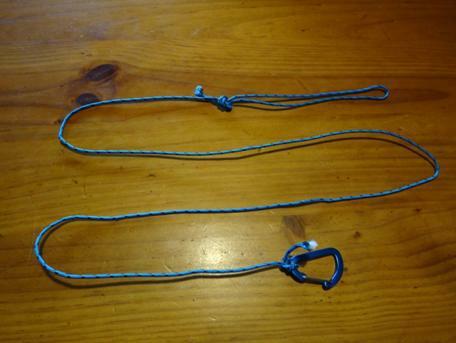 I KNOW I could have made them lighter with (black) dyneema, but I have run out of it. Great product: there is even a flat kind, good for shoe laces too perhaps. I could have omitted the clip and just had a loop at each end. If I hadn’t been so slack I could have spliced the two loops as well = 5.5 grams!